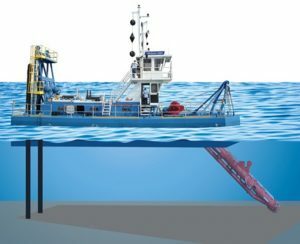 [/media-credit] This illustration shows how the dredge arm descends to pull debris from the floor of waterways. Imagine the challenges of an offshore dredging operation: floating in a sea of corrosive liquid; isolated and basically self-contained; and with the hydraulic systems located in a dark, noisy, hot, cramped engine room far from the equipment it controls. 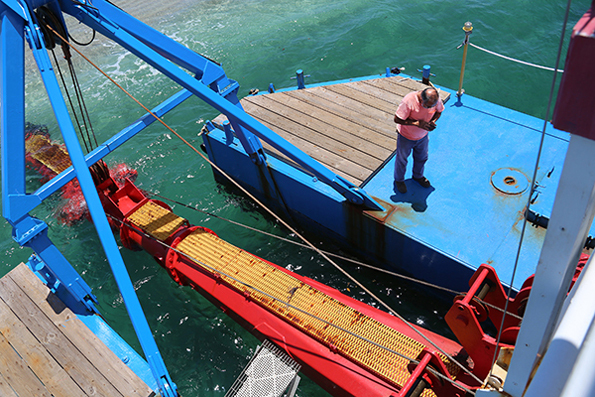 These are conditions Woodworth “Woody” Draughon and Assistant Captain Scott Evans face while running a year-round dredging operation at the Hillsboro Inlet on the east coast of Florida. The 1170-S dredge at Hillsboro Inlet uses between 25 and 30 Sun cartridge valves and five Sun coils for control of directional and proportional valves. One of the Sun valves, an electrohydraulic proportional valve, controls the swing winch used to adjust the speed of the dredge arm movement and has to be configured to ensure proper operation. Hydraulic winches control positioning of the vessel’s dredge arm and a hydraulic motor rotates the cutter head that pulls debris from the waterway floor. With the cutter head at the bow of the dredge, the control room two stories above the deck, and the engine room at the other end of the dredge and down below the deck, the process of fine-tuning the valve includes a lot of back and forth, up and down ladders. The captain has to drag a handheld programmer and cables down into the cramped, dark engine room to the winch control hydraulics, connect physically to the amplifier, step through the settings, then climb back out and up to the control room to operate the controls and view the results of those settings. From start to finish, fine tuning the valve to optimize the winch performance can take hours. Sun’s new Bluetooth Embedded Amplifier, the industry’s first commercially available Bluetooth-configurable product, provides a compact, factory-integrated coil and connector combination for use with Sun’s proportional solenoid valves. And yes, there’s an app for that. 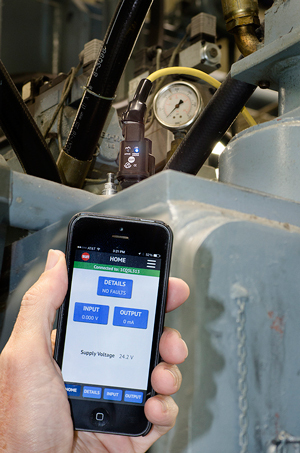 Users configure the embedded amplifier wirelessly using Sun’s AmpSet Blue app on their iOS and Android mobile devices for quick, easy, reliable wireless calibration. For in-depth information about the Bluetooth Embedded Amplifier see the video presented by Sun Hydraulics. https://youtu.be/qWq9MskQ0TM. For additional information please see a the sun-hydraulics_bluetooth-amplifiers catalog. John Caldwell of Advanced Fluid Systems saw an opportunity. A Sales Engineer at AFS for more than 25 years, Caldwell has worked closely with Ellicott Dredges on hydraulic and electrical systems. He knows first-hand the challenge of configuring a new amplifier on these dredges and targeted this application as a perfect example of how this new approach to remote, wireless amplifier configuration could save time, money, and effort. Caldwell contacted Draughon, proposed the installation of the new Bluetooth amplifier, and headed south to Hillsboro Beach. Because it requires no stand-alone programmer or laptop with special cables, all that was required for a successful installation of this new solution was the Bluetooth amplifier and Draughon’s iPhone. Even though the dredge’s proportional control valve is buried deep within the bowels of the engine room near the stern of the vessel, Bluetooth communication allows for making adjustments at a considerable distance from the valve. Having wireless remote control of the Sun Hydraulics’ Bluetooth Embedded Amplifier offers a new level of convenience and safety in configuring hydraulic systems in challenging locations. New users can download the AmpSet Blue app with their iOS or Android smartphone that’s already in their pocket, launch the app, pair with the amplifier, and begin configuration in minutes. For the crew on board the dredge at the Hillsboro Inlet, who spend a lot of their time maintaining their equipment in a warm, humid, corrosive environment, it’s a major benefit to quickly, precisely dial in the dredge arm speed while spending less time in the engine room and less energy climbing up and down the ladders of the dredge. This new Bluetooth amplifier/app combination opens up opportunities across a broad range of applications, both mobile and industrial, where cost, reliability, ease of use, and security are critical. Add to that its noise compliance and robust environmental protection, and you have a solution for many of today’s most challenging electrohydraulic applications. Original article appears in Hydraulics & Pneumatics Magazine, written by Chad Lampton, Product Engineer at Sun Hydraulics Corp.